Today’s image for Day 317 of the VM_365 project shows the parish church of St Mary Magdalene, Monkton which is located at the western end of Monkton just off Monkton Street. The church is mainly built from flint and Thanet Beds sandstone with Caen and Ragstone used for the quoins. 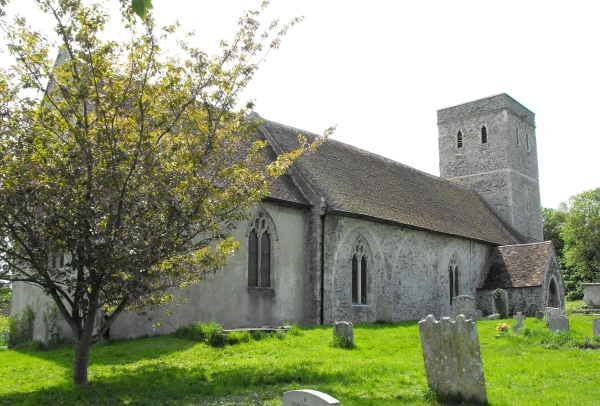 The church of St Mary Magdalene was located within the Manor of Monkton which was given to Christ Church Priory, Canterbury in the late Anglo Saxon period. Two churches were documented in the Domesday Book of 1086 as being part of the Manor of Monkton, one of these probably stood on the site of the present church, which was constructed in the late 11th to early 12th century; the other is probably its dependent church located at Woodchurch, Acol. The church remained in the possessions of the monks of Christchurch until the dissolution. The tower was constructed in the late 12th or early 13th century, around the same time that the church nave was increased in size by constructing a new northern aisle along the entire length of the north side. In the late 14th or early 15th century major alterations were carried out to the church reducing it in size and adding new windows and roofs. These alterations may have been undertaken as a result of the reduction in population of the inhabitants of the area because of the Black Death. You can see an example of these alterations in the image above as a series of three of the five blocked arches along the northern side of the church, evidence of the demolition of the late 12th century extension to the nave. The church was restored in the mid 19th century by C. A. Beazley; the chancel floor was raised, a new vestry constructed under the tower and the north porch was rebuilt and outer doors were inserted. Most of the interior fittings of the church date to this time. Hasted, E. 1800. The History and Topographical Survey of the County of Kent: Volume 10. Bristow: Canterbury pp. 253-264. Tatton-Brown, T, 1993. St Magdalene Church, Monkton. Canterbury Diocese: Historical and Archaeological Survey. Kent Archaeological Society. The image for Day 280 of the VM_365 project shows a Bow Brooch or Fibula of late Iron Age or Early Roman date, which was found in 1992 when trial trenching was carried out between Monkton and Minster in advance of the expansion of the old single lane road into a dual carriageway. The Bow Brooch is made from copper alloy and has a perforated catch plate to cover and secure the pin. Classified as an early Colchester type, it dates to the period between 25 BC and 50-75 AD. 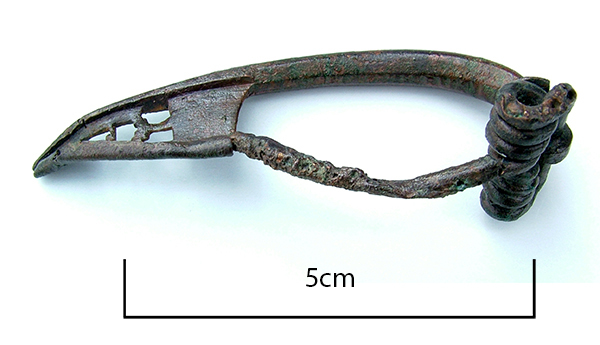 Like many clothes fastenings and small personal items, Bow Brooches like this formed part of the Late Iron Age costume and continued to be worn into the Early Roman period, despite the many material changes the Roman invasion brought to the country. Because of the continuing influence of indigenous costume and the fastenings and ornaments that were associated with them, a distinctive Romano-British hybrid culture eventually emerged, drawing on elements from both cultures. 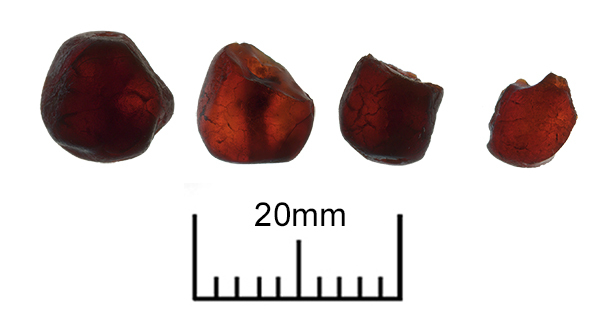 Today’s image for Day 275 of the VM_365 project shows four amber beads found in Grave 32 of the Monkton Anglo Saxon cemetery, part of which, was excavated in 1982. The 6th century grave, was orientated east west and had been heavily truncated measuring only 0.14 metres deep. It contained only the fragmentary skeletal remains of the long bones of the leg and a single tooth to indicate the presence of the individual who had been buried there. The beads are a mixture of roughly shaped pieces of amber that have been pierced through their length (far left) and carefully carved cylindrical shaped beads that have been broken on one end. 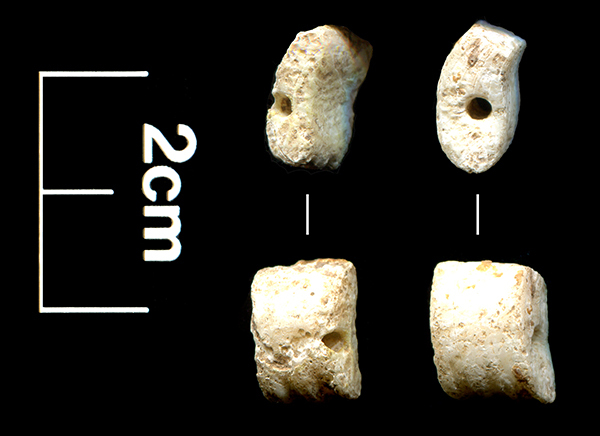 The bead on the far right is a fragment that has broken through the centre. The holes through the centre of the beads can be seen on all four if you look carefully. Amber is fossilised tree resin and Anglo Saxon amber beads are assumed to have been imported from the shores of the Baltic where large deposits are well known. However deposits of amber are also known along the east coast of England and it cannot be assumed that all of the amber beads found in Anglo Saxon graves are from the Baltic shores; they may have been traded down the East Coast of Britain. It is not unknown for pieces of amber to be washed up on the beaches of Thanet. Today’s image for Day 269 of the VM_365 project shows two different views of the Anglo Saxon shell beads that were found in Grave 33 at the Monkton Anglo Saxon cemetery in 1982. These two shell beads are most likely carved from Cowrie shell, the ribbing along their edges being the natural lip of the shell. These beads were probably imported along the same trade route from Byzantium as the amethyst beads found in the same grave and featured in yesterday’s VM_365 Day 268 post. Cowrie shells have been found in other 7th century graves on Thanet in Grave 238 at Sarre and Grave 323 at St Peters, Broadstairs. They have also been found in graves of a similar date at Wingham and Kingston, Kent. Those shells, however were whole and the suggestion is that they were treated as amulets. We do not know whether the beads found in the grave at Monkton arrived in Thanet as part of a whole shell and were carved locally or whether they were imported already crafted into beads. Today’s image for Day 268 of the VM_365 project shows four amethyst beads excavated in 1982 from a grave containing a female buried at the Monkton Anglo Saxon cemetery. 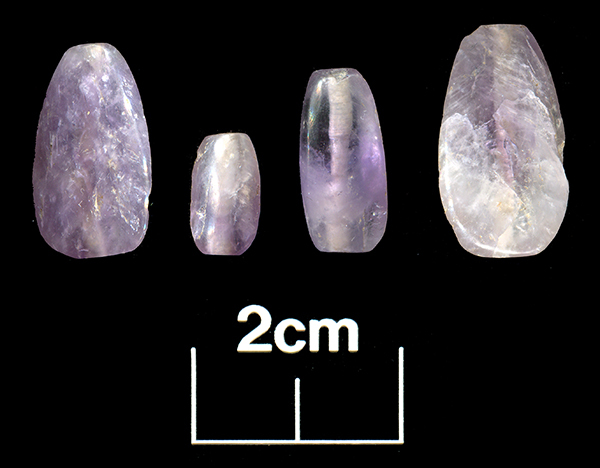 These four roughly almond shaped amethyst beads were found as part of a necklet along with two shell beads probably cut from a cowrie shell. The beads formed part of an early 7th century burial and are imports from Byzantium having been traded along the route from Aquelia, over the Alps, down the Rhine and then on to Kent. If you look carefully at these beautifully translucent beads you can see the finely drilled holes, which show opaque, through which fine cord was passed to string them into a necklet. If you look very closely you can even identify the spirals caused by the rotation of the drilling implement. Graves from the Monkton cemetery were first identified during the laying of a gas pipeline in 1971 when 22 were identified. A further 12 graves were identified during the laying of a second pipeline in 1982. The image for Day 241 of the VM_365 project is of a pottery vessel placed with a skeleton in a Roman grave discovered on a gas pipeline project at Thorne, near Cliffsend. Vessels from a cremation group from the same area, discovered in the same pipeline project, were shown in the post for VM_365 Day 239. The north south orientated grave contained the skeleton of an adult around 25 years old. The small pottery beaker or jar was found along with a flagon near the head of the individual. The pot is made in a grog tempered fabric, where fragments of crushed ceramic has been added to the clay paste. Occasional stone grits are also visible where they protrude from small faults in the surface. The outer surface of the pot has been lightly burnished. 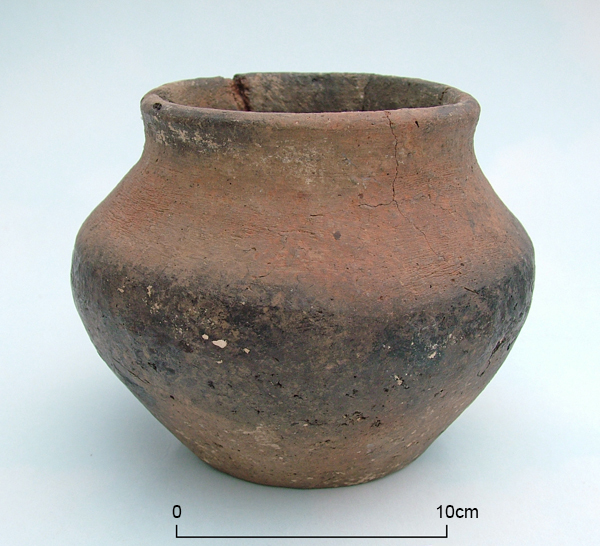 The range of vessels that were recovered from this small cemetery illustrates the market for a wide range of styles of pottery and probably the diverse products that were shipped in the pots, which existed in Thanet in the Roman period. Each grave is a snapshot of the pottery that lay to hand as the accessory vessels for a burial or cremation were assembled. The surviving vessels from grave groups, as well as those from remarkable survivals like the dump of Roman kitchenware discovered at Broadstairs, allow archaeologists to reconstruct the suites of pottery that were available to settlements in Thanet. Today’s image for VM_365 Day 147 is a small silver square headed brooch excavated from an Anglo Saxon grave at Monkton near Minster in 1982. The brooch is no longer in our possession and the above photograph was taken in 1982. 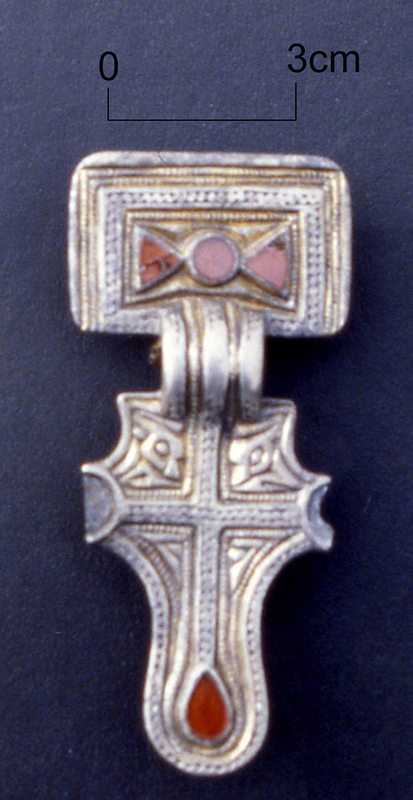 The brooch was found in the grave of a female buried in the second third of the sixth century. Remains of gold threads similar to those found at Sarre were found on the skull and other finds included a bronze ring for a purse or bag at her waist, a bronze buckle and amber beads over her upper body. The brooch was found on her left shoulder. The brooch is made of silver with gilding applied by mercury amalgam. It is a Kentish type with similar brooches found at the cemeteries at Sarre and Bifrons and may have been worn alone as a cloak fastener.